How do they do it? Some of the top athletes in our sport race two, three or even more IRONMAN competitions in one calendar year. While this may not be for everyone, it does provide evidence that with proper preparation and recovery it is possible to utilize that hard-earned IRONMAN fitness to enjoy (or conquer) two IRONMAN events in a relatively short period of time. Why Two in a Row? When developing an athlete, particularly a professional athlete, and considering their long term performance gains, I prefer to separate IRONMAN competitions in the calendar year. A spring or early summer IRONMAN, followed by a fall event (hopefully IRONMAN Hawaii!). This allows for two long, systematic progressions that redevelop aerobic energy systems and guide the athlete to a well-planned peak twice per year. Unfortunately, for most of us regular folk, the downside of this two-peak season is that it equates to nine to 10 months of time consuming, long distance training throughout the year. This is not always sustainable in real life context of family and career, and in many cases it can be pretty hard on your body. For an experienced endurance athlete, with proper planning you can maintain your IRONMAN endurance from the first event and re-polish some key energy systems to have a second successful event just a few months later. In fact, many athletes outperform their first IRONMAN in their second go-around. An optimal starting point to your two-IRONMAN summer is to make sure that 10 weeks out from your first IRONMAN, you are healthy, and in great general triathlon shape. Ideally, you should arrive at this point in good threshold condition, and preferably with a couple races under your belt. You should be comfortable with 3,000m swims, 90 minute runs and four-hour bike rides. Proper preparation greatly affects how you will handle the distance of IRONMAN, and how long you’ll need before returning to training after the first IRONMAN. Additionally, how you manage your recovery coming out of IRONMAN is a huge factor. Have a recovery strategy in place to get you back on track. Having a well thought out plan, and setting timeline goals with an emphasis on different energy systems greatly increases your chances for success. Intersperse two week training blocks of time with planned recovery weeks. A recovery week should have two days completely off from training as a minimum, and be approximately 50 to 65 percent of the training volume of the previous “build” week. Starting this period of time in good shape, the focus is building endurance. Limit the intensity of sessions so that you can backup more frequent, high-volume training days. Two weeks of endurance swimming, biking and riding focused on building aerobic capacity and strength, followed by one week of recovery. Aerobic Endurance Runs of 1.5 to 2.5 hours. Run hilly. Having adapted to the longer sessions of the last training block, your goal now is to swim, bike and run a little bit faster over the longer distances. You are building efficiency at your goal IRONMAN pace by interspersing sections of pace work into your long aerobic efforts. Two weeks of endurance riding and running focused on honing race-specific pace and rhythm, followed by one week of recovery. Aerobic endurance rides at goal race pace/heart rate in your aerobars. Brick runs off the bike at IRONMAN goal race pace/heart rate for 15 to 60 minutes. Swimming aerobic power: long sets such as 3 x 1,000m or 3,000m straight which build to goal IRONMAN swim pace. 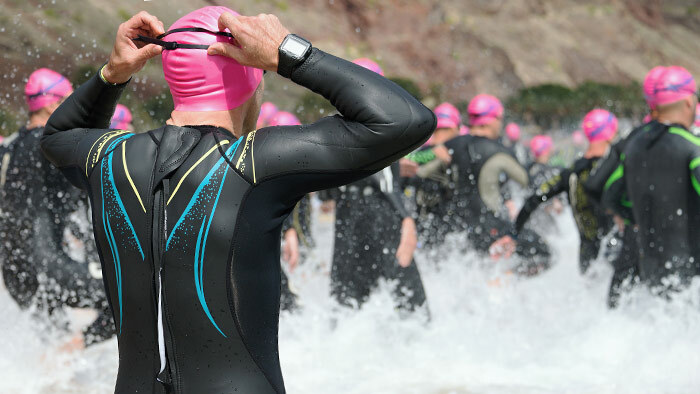 The goal of this training block is to peak for your first IRONMAN competition. Reduce overall training volume by approximately 20 percent and focus your training weeks around one very strong long run and ride per week. Going long is not the goal, but instead focus on challenging your aerobic system and fine-tuning your body for race day. 2 weeks of building aerobic power with riding and running focused on moving faster than goal IRONMAN pace. One Aerobic Power ride per week of 4 to 5 hours, including 3 to 4 intervals on flat terrain of 20 to 45 minutes at 1 tp 2 miles/hr faster than IRONMAN goal race pace, or heart rate 5 to 10 beats above target IRONMAN heart rate, in your aerobars. One aerobic power run per week of 1.5 to 2 hours on flatter terrain, which build by one-third throughout the run to finish at approximately your Half IRONMAN pace for the final third. Swimming lactic threshold sets: such as 15-20 x 100m with 30 seconds rest, trying to swim 3 to 5 seconds per 100m faster than goal IRONMAN swim pace. 2-1 weeks (2-week block) into IRONMAN #1: Taper and RACE! The work is done, and the last two weeks are about absorbing your training and sharpening for race day. It is important to stay mentally engaged and focused in your taper sessions. Allot the final two weeks before the race to rest (“tapering”). Start with 3 to 5 days of rest and light activity. The next 4 to 6 days are for “activation” (shorter training sessions at race specific speed). The final 3 to 5 days are for more rest and light activity prior to race day. Twelve weeks is a good amount of time between events, though 10 to 16 are common, in which case you may need to fine tune the progression between events. Regardless of timeline, the five weeks out of IRONMAN #1 should be similar to what is listed below. The first two weeks after IRONMAN are critical to your ability do the IRONMAN double. Take special care of your body and respect any aches or pains. Be particularly careful working back into running. The most common incidents of post–IRONMAN injury come from too much running too soon. 2 weeks of recovery and aerobic shorter aerobic activity. 1 to 7 days after the race: No running for 7 days after the race, and a minimum of 3 days completely off, avoids pounding and helps the legs recover. Take at least 3 days this week. 8 to 14 days after the race you can incorporate short aerobic runs (20-35 minutes), slightly longer rides (60-90 minutes), and swims. Aerobic swims of 1,000-3,000 meters, with an emphasis on technique. Gradually build back into aerobic work, but still be respectful of the IRONMAN that is in your legs. Keep all cycling and running very aerobic through this block. You may start to feel good on the bike, but hold back as recovery will still be slower than normal. Getting too aggressive with your training too soon can set you back two to four weeks in your rebuild. Make sure you have planned two rest days per week into your schedule. 2 weeks of endurance swimming, biking and riding focused on re-building aerobic capacity and strength, followed by 1 week of recovery. The athlete should still take 2 days per week off, and overall training volume should be approximately 75 percent of maximum training volume in build number one. Note that we are revisiting aerobic power farther out from IRONMAN number two than IRONMAN number one. You can rely on your endurance from the first build and from base miles earlier in the year. The goal is to tap back into your run and bike strength and re-stimulate the higher end of your aerobic energy system. 2 weeks of building aerobic power with riding and running focused on moving faster than goal IRONMAN pace, followed by one week of recovery. Aerobic Power Rides of 4 to 5 hours, including 3 to 4 intervals on flat terrain of 20 to 45 minutes at 1 to 2 miles/hr faster IRONMAN goal race pace, or heart rate 5 to 10 beats above target IRONMAN heart rate, in your aerobars. Aerobic Endurance Runs of 1.5 to 2 hours on flatter terrain, which build by one-third throughout the run to finish at approximately your Half IRONMAN pace for the final third. Swimming aerobic power: long sets such as 3 x 1,000m or 3,000m straight, which build to goal IRONMAN swim pace. The higher your threshold, the faster you can move at an aerobic heart rate. In this training block reduce the intensity of your longer sessions, and incorporate some higher intensity session at elevated heart rates. This will allow you to tackle the hills and pace variations of IRONMAN effectively and recover quickly back into your aerobic IRONMAN rhythm. 2 weeks of building lactic threshold, while maintain some aerobic base. One aerobic rides per week of 4 to 5 hours. One aerobic endurance run per week of 1.5 to 2 hours on flatter terrain. One to 2 Lactic Threshold runs per week, such as 30 to 40 minutes of high intensity running, or interval sessions of 4 to 5 x 1 mile with 2 minutes recovery. One to 2 bike threshold workouts per week, such as 45 to 75 minutes of high intensity riding, or interval sessions of 4 to 5 x 10 minutes with 3 minutes recovery. Swimming lactic threshold sets: such as 1,000m time trial, 30 x 50m with 20 seconds rest, trying to swim 3 to 5 seconds per 50m faster than goal IRONMAN swim pace. 2-1 weeks (2 week block) into IRONMAN #2: Taper and RACE! The final two weeks should be similar to your previous taper. Note how you felt on race day the last time and decide whether you need more rest or a little more activation.